I’m pretty sure that by now the whole country knows of the Duggar scandal. If not, then I will fill you in on the basics of the situation. The hit show 19 Kids and Counting is about a conservative Christian family with 19 kids. It was discovered that one of the grown up and married children, Josh Duggar, molested five young girls (reports stating that some of the victims are his own sisters) when he was a teenager. I’m just going to be open about this and admit that I loved that show. Seriously…I would faithfully watch it every Tuesday night and talk about how awesome I thought they were. I don’t watch a lot of TV. I find cartoons more entertaining than the “adult” shows that are on cable. About six months ago, I saw Jill Duggar’s wedding on TV and got hooked. Needless to say, finding out about this whole scandal while I was up north was quite a shock and a disappointment. And that’s when I realized, why am I shocked by this? These are human beings! They are a family that has 19 kids–certainly there’s going to be drama somewhere. What Josh Duggar did was wrong, and clearly there needs to be action taken to help the victims if they have not already gotten it (as well as help for Josh). But we need to remember that Josh and the rest of the Duggars are no better than the rest of us. The point of this post is not to defend or condemn the Duggars (there are millions of people online who are doing that job). 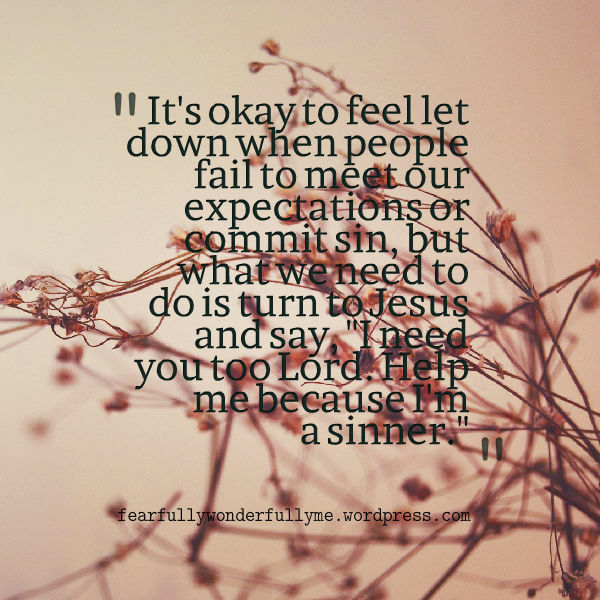 I want people to realize what I have realized: we are all broken and in need of a savior. I thought that the Duggars were so righteous with all of their rules and super-conservative dress and dating principles. However, our behaviors and human rules do not make us righteous–Jesus does. [And] be found in Him, not having my own righteousness, which is from the law, but that which is through faith in Christ, the righteousness which is from God by faith; (Philippians 3:9 NKJV). We need to value each other and hold other believers to higher standards, but more importantly, we need to examine our own lives and how we are behaving. We need to keep relying on the grace of God and be forgiving of each other. Examine yourselves as to whether you are in the faith. Test yourselves. Do you not know yourselves, that Jesus Christ is in you?—unless indeed you are disqualified (2 Corinthians 13:5). I want to send this message to all Christians–especially new believers or those struggling in the faith–do not let the actions of the Duggar family, or any other Christian public figure, make you doubt your faith. The flaws of this family and every other Christian family in the world only prove our need for Jesus. We continually need to seek Him and His righteousness; we cannot be made perfect by ourselves (Philippians 3:12-14). Christ is our hope. Let us rejoice and be thankful that God loves us just the way we are right now as we continue in faith! There are so many families, Christian and non-Christian, who have suffered this kind of reality. Perpetrators and victims alike are invited to go deeper into Truth. Both will find Grace to be healed…and power to change. I was concerned as to how you were going to deal with this subject. I am very pleased with both the Grace and Truth I found here. Thanks so much for your comment! It took me lots of prayer and meditation to find the words to write. My prayers are for both the Duggar family and the victims. Only God knows the whole truth, and He is the great physician!